Marathon #2 has been selected. Kelsie Lou is Rockin’ the Lou this fall at the St.Louis Rock ‘n’ Roll Marathon. Thanks to my friend Karen, I have a new training group. She invited me to a group run last week for 10 miles at a 8:15 pace. I knew this would be a challenge because I trained last year at 9:15. My introduction to the group started with 10 miles from the Highlands, along Main Street, crossing the Big Four Bridge to Indiana, and crossing back to KY along the 2nd Street Bridge. I managed to stick with the group thanks to Karen’s help. We were supposed to run at an 8:15 pace, but I felt like I was in 5k mode when I saw 7:48 times beep on my Garmin. This group is fast! What could I expect running with a 24 time marathon and 50 mile ultra for a 50th birthday completor? There are Triple Crown winners and a few Boston completors in the mix too. Week #2 was a route of 15 miles. Again, 8:15 was the goal. One guy took off and we never saw him again. He ran like he had a firecracker attached to his you know what. This run was harder because we hit the hills of Cherokee Park and connected to Seneca Park. Tammy, the Ultra completor, is the GPS for the group. After we ran down Frankfort Ave, we pounded the Greenway Trail along the Ohio River. I was whooped! The scenery was new as we passed the UofL Rowing Team practice area and a Jug Band historical site. I thought to myself how I needed some change to catch the Tarc back to my car. My Garmin battery went dead as we approached downtown. The Color Walk Run was in full effect as we weaved through the city streets. I was in bad shape. The other runners were in our sights but never easing up on pace going into the last few miles. Another thing that kept me motivated was relying on Tammy’s watch. There was no way I was putting in all this work with out an accurate record of my run. The plan was 15 miles, but we reached our starting spot at 14.32. Her watch read 1:58. That was an 8:14 pace. We’re talking Boston Qualifying pace for my age group. My ultimate goal is to BQ in time for the 2016 Boston Marathon. If I stick with the Not Quite Ready For Prime Time Runners my goal is in the palm of my hands, or should I say the soles of my feet. Going back to the title of this post, when someone is willing to help, you don’t back down and quit. Tammy sacrificed her pace to encourage me. Karen was nice enough to include me on a plan which lead to her BQing after her first marathon in Chicago last year. Giving up is an obstacle I sometimes face as a Teacher and Foster Parent. Help is abundant, yet some youth are unwilling to push for that extra edge that will later benefit them in life. Karen and the rest of the group were waiting for everyone to finish. Tammy continued up the block to get in her full 15 miles. No, matter how tired I am, I will never shy away from a camera. Check out this app Karen hipped me to called Fit Snap. Unfortunately, it’s only available for iphone users. So, this is what my body is going to experience for 18 weeks of training starting soon. That’s another thing, this is all extra credit work. I still have a week or two to play with until the countdown to October 19th begins. As long as I have that work/play balance this will be a successful 18 weeks. 12 hours after I ran by the KFC Yum! Center, I was showing off my gams at the Midwest Music Festival. I’m smiling through a drained blister on my right baby toe and light chaffing on my thighs from my running skirt. 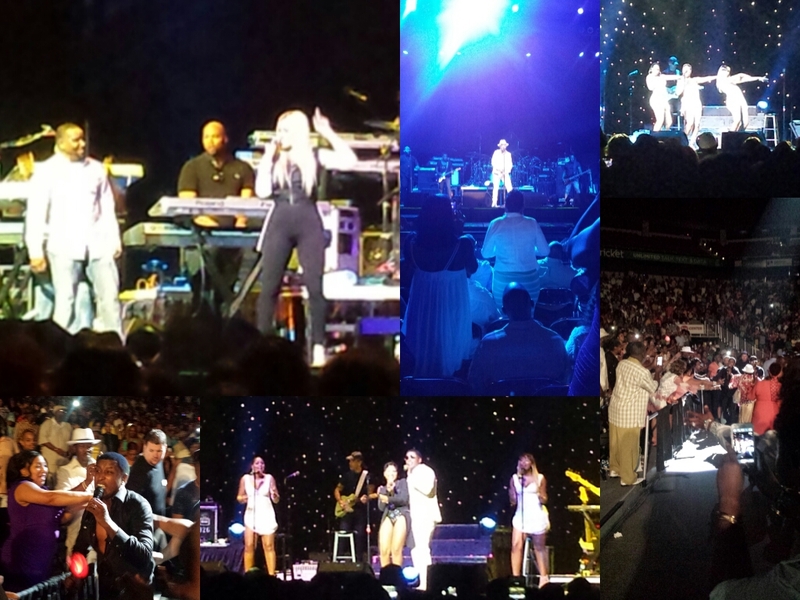 Avant, Keke Wyatt, Anthony Hamilton, Babyface and Toni Braxton rocked the stage. The concert was rather long. 7:30-1:30 a.m.?!?! I could have ran a marathon and recovered in that time. That’s how the mind of a passionate runner thinks! This entry was posted in fitness, Louisville, marathon, running and tagged Rock 'n' Roll Marathon, St . Louis. Bookmark the permalink. Wow what an awesome training group!! I need to find one exactly like that for my fall marathon. 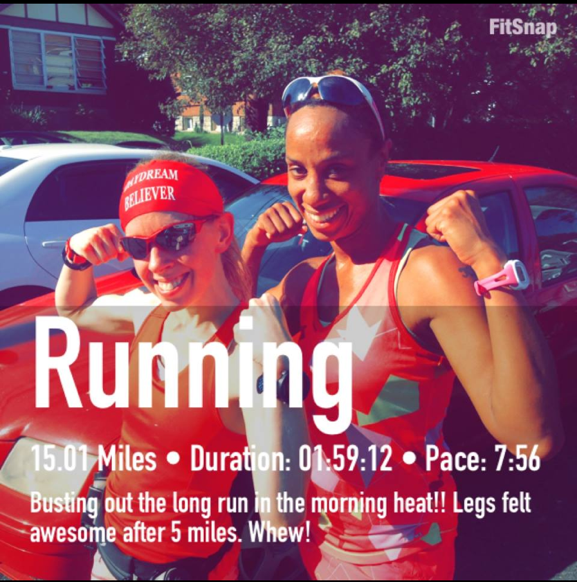 That is an amazing time for your 15 miler! Congrats on choosing/signing up for your race and I’m so excited to follow your training! I’m happy to follow you on your journey as well. Excellent idea of yours for the marathon roll call. I’m always looking to learn from others. Excellent running! Looks like you and I are aiming the same goals and using the same tactic to get there: Training with the people I call, “Fasities” or “marathon titans”. Doesn’t it feel great to go fast for distances you didn’t think you could do that at before? It will all be worth it! Good luck! The feeling at the end makes it all worth it! Boston qualifying just became a recent goal. I have about 15 months to make it in time for 2016. I need to catch up on your posts. I must have unfollowed your blog by accident. It was an honest mistake. These mobile devices make it easy to press things unintentionally. Boston is a great goal. I sincerely hope you make it! I hope we both get in and can meet each other there! What time are you aiming for? I need 3:40 and my first marathon (Marine Corps) was 3:45:54. Sounds sorta easy to shave 6 minutes off but I know the pain and agony it took for the time last year. I have to dig deep this time around. My goal will be 3:35 to make sure I get in. I need 3:35 just to qualify, and a 3:30 to ensure it. My best was run without really trying / training for faster times, a 3:49 at the Air Force Marathon. I ran a 3:53 at the Pig this past May, and didn’t feel like I was trying hard at all, so I just need to get comfortable with the idea of being uncomfortable, really… Which I don’t like… But we never get better sitting in comfort do we? I think you can get it. I really do. Keep working toward it! Daaang, great run! And good luck on your training! Ha, and you sound like me, comparing events to run times. Plus, I don’t like staying out late anymore…I have to get up and run in the morning. I guess I’m old! Thanks Scott! Yeah, my Mom laughs at me when it’s still daylight and I tell her I’m going to sleep. By Saturday, my body is used to it. Its the m-f that gets me wanting to hit the Snooze over and over. Last year, I did a lot of Sunday runs and it ruined my Saturday plans. You are going to rock your next marathon, fabulous woman!! Mental preparation is just as important as those long runs. I have my mind made up so ain’t nothing to it but to do it! ALSO…one thing I love so much about the running community is how we help each other. Friends and runners should help one another out. We all want to reach our own goals, but seeing others reach theirs is just as important. At least to me. And to Tammy. I can honestly say that!! I agree. Tammy was so sincere in talking to me. Hopefully, I will be able to hold a conversation with her and the group as time goes on. My quads are still sore!! Tammy is awesome!! I adore the heck out of her! One of my favorite people!! My legs were heavy for the first 5 miles then finally came to life. I usually lag in the back for most of the runs with that group because I’m one of the slower ones…LOL…and because I like to fly at the end. Ironically, this faster group isn’t who I ran with when I was training last year (with BQ-ing on my mind!). Most of my long runs were instructed to be done at the LSD (long slow distance) pace to work on endurance. It was only near the end of my training that I had some marathon paced runs. The endurance was there then…so all that was left was to add the speed after a couple miles of a warm up and then throwing the last few miles in as a cool down. Confidence booster to know that all those longer, easier runs gave me the stamina I needed. Basically…the gist is that running slow makes us fast. Doesn’t make sense, right? That’s what I thought, but running slow and long (at least one hour but ideally 90 minutes plus) once a week builds our endurance base, which is crucial in longer events. Running long (aerobically) at conversational speed is the best method for building more capillaries around the muscle fibers, which can then supply a greater volume of oxygen to the working muscles, meaning less fatigue (mentally and physically). During LSD runs you become more economical with your fuel expenditure (learning to burn less for a given pace) which translates very well to all aspects of endurance events. These longer, easier paces also help increase leg strength and resistance to mental fatigue as well as physical. Sounds counter-productive, I know, but these sorts of runs helped me tune into my body more and find the focus and determination I needed at the end of my long race when all that fatigue starts to hit. These easier long runs are how I worked my training last year. Speed is of limited importance: it’s more about time on your feet. Run too fast and you’ll risk injury and over-training. Then, as I said, in the last few weeks entering into my taper…it was MP with the distance (after those important warm up miles…and then followed them with the cool down miles for my grand total of the day). BTW…Dennis said we ditched him, LOL! I told him he had it backwards!! ALSO…you were smoking that dress, lady!! Yep…we gotta go shopping!! I felt a little surge down Frankfort ave. Then, I had issues with my hydration belt being too loose so I fought that along that new Greenway part. I haven’t used it much since last year and I loosened it thinking it was too tight. Bad idea because it kept riding up and twisting. Endurance is definitely going to be the key to my BQ success. I hope the Rock ‘n’ Roll has pace groups. Last year, I was not in favor of them but this year I am willing to run with one. If I feel a reserve at the end (last mile or so), I can empty the reserves. I need to experiment with the gels too and more hydration. Thanks for sharing your knowledge and experience with me Karen! I hope others read and gain from this information. I hope so too! I BQ’d by a large margin using these tips. Always happy to help others perhaps do the same. Taking a step back sometimes isn’t always bad as long as you come back two steps ahead. (mother’s Wit)! That’s what I’m talking about Mom!